Glycyrrhiza uralensis (GU), a member of the Leguminosae family, is a traditional medicinal herb grown in various parts of the world . This plant has long been used to treat fever, liver ailments, dyspepsia, constipation, gastric ulcer, sore throat, asthma, and bronchitis . In addition, the roots have been extensively used for more than 4000 years as a sweetening and flavoring agent in candies, foods, tobacco products, and toothpastes . Flavonoids and triterpenoid saponins are shown to be the major constituents, which possess pharmacological activities . Among them, flavonoids, such as liquiritin and isoliquiritin, are gaining popularity because of their significant pharmacological activities, including antiulcer, antioxidant, anti-inflammatory, antimicrobial, antitumor effects, etc. . 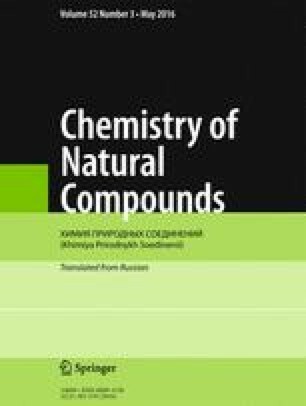 However, the free-radical-scavenging activities of phenolic compounds from the ethyl acetate extract of Glycyrrhiza uralensis have never been reported. Published in Khimiya Prirodnykh Soedinenii, No. 3, May–June, 2016, pp. 424–425. This research was financially supported by the National Eleventh Five-Year Research Program of China (2011BAC09B04) and the Key Research Program of the Chinese Academy of Sciences.